Tri-blend t-shirts are one of the most popular options for apparel printing. Tri-blend t-shirts are made up of three materials—cotton, polyester, and rayon, and look great when decorated. The fabric is super-soft and comfortable, making tri-blends a popular choice. But although they’re a great option for wearing, there are some challenges screen printing on them. Here are some things to consider when screen printing on tri-blend shirts. Most screen print inks are heat-cured, which means you need to place the shirt through a dryer to cure the ink. Standard Plastisol inks cure at 320 degrees, but an issue arises because around this temperature. The dyes in the poly fibers are sublimated to a gas and travel through the ink. This can stain the screen printing inks with the shirt’s dye color. 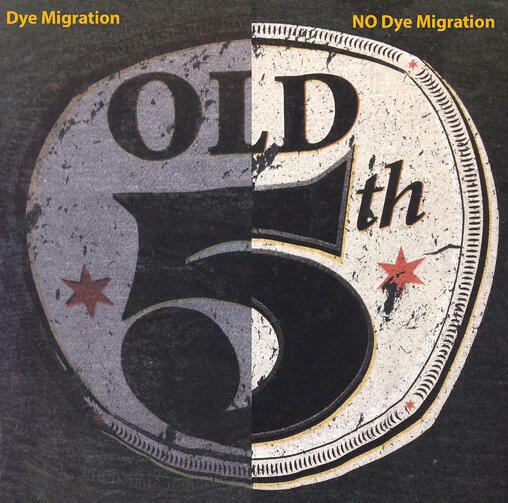 This is referred to as dye migration. Luckily, there are low-bleed inks designed to combat this issue. Those inks cure at lower temperatures to avoid the dye from bleeding into the ink, and avoiding that point of sublimation. The best way to get a soft hand print on a tri blend is to use Waterbase inks. The issue is the print will not be vibrant and will have more of a washed out Vintage look. We recommend that if your customer wants a soft hand on a triblend shirt they should expect the design to have a vintage washed out look. Another issue that can arise when screen printing on tri-blend shirts is that the image or print can become distorted due to the shirt’s stretchiness. Similar to a tattoo gotten at the peak of one’s youth that has aged poorly over time, an image pressed onto a tri-blend shirt can become stretched out and distorted if extra care is not taken. This issue is easy to avoid, however more time must be taken to load the shirts onto the table as well as remove them from the table to avoid marring the image. Multi-colored designs are pretty popular, but tri-blend shirts tend to scorch easily by the flash units that are necessary for spot-curing colors on multi-color prints. It’s best to avoid multi-color designs when doing a screen print on tri-blend t-shirts. Finally, tri-blend shirts can simply be a bit difficult to work with, physically. The rayon in the blend makes the shirt slick, and can make it difficult to tack the shirts down onto the pallets on the press. This can lead to registration issues in the print, causing the print to look off-set and the colors to over-print slightly on top of one another. Screen printing on tri-blend shirts does present some difficulties, but thankfully, they’re not unavoidable and it’s fairly easy to work around them. With the proper supplies and equipment available and professional screen printers, your image will screen print on tri-blend shirts perfectly. To find out more about screen printing services for tri-blend shirts and more, contact Sharprint today.